We are engaged in manufacturing and supplying Conventional Fire Alarm System. These Conventional fire alarm system provides the earliest fire detection. This Conventional fire alarm system consists of smoke, beam or heat detectors at designated locations, to detect smoke or heat at the earliest during any outbreak of fire. 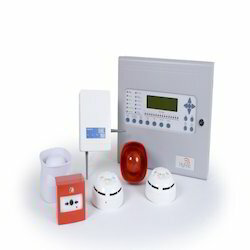 Our domain expertise has enabled us come with a remarkable range of Conventional Fire Alarm System. These fire alarm systems are manufactured using quality assured raw material employing latest tools and techniques. All the fire alarm systems offered by us can easily detect fire well in advanced so that people get enough time to evacuate the premises. To meet the distinguish needs, clients can avail these conventional fire alarm system in various types such consists of smoke, beam or heat detectors photoelectric, heat, beam and multi-sensing. Looking for Conventional Fire Alarm System ?